Local search optimization is an often underappreciated part of the automotive digital marketing mix. You know it needs to be done, but you don’t give it the time and energy it deserves. Typically the work is focused on a few of the major players and at that point focus usually turns to more “exciting” tasks. For a particular car dealer in Atlanta, we had already completed the basic local optimization tasks. Most of our work focused on content development for specific products, and we had great success with vehicle related searches. In fact organic traffic, year over year, had increased over 124%, but we were not efficient with general dealer searches. (i.e. “Acura Dealer Atlanta”). Going back and reviewing the opportunities, we discovered that we had only scratched the surface with local optimization. We began to research other options for increased local search visibility. Our goal was to increase the scope of our efforts and still keep our white hats on. We believe it should always be your intention to leave the internet a better place than you found it. So, after clearing out the major and minor citations, we began to look for other options. Creating and optimizing social profiles appeared to be the next logical step. Looking for a way to scale our efforts, we discovered KnowEm, which endeavored to be the ideal solution. Within two weeks, we began to see SERP gains for our targeted keywords. Within four weeks ranking for our primary keyword improved 15 positions and we saw an average increase of 3.6 positions in their overall Google ranking. 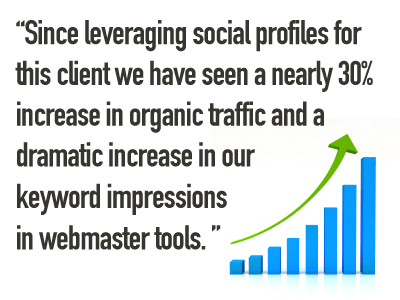 Since leveraging social profiles for this client we have seen a nearly 30% increase in organic traffic and a dramatic increase in our keyword impressions from webmaster tools. Additionally, Google has recognized 26% more links since activating this strategy. We know a magic bullet for SERP increases doesn’t exist, and taking too much credit for success will only leave you with the blame when things take a down turn. But, we do learn something every day. If you have a brick and mortar, it is imperative that you focus on your local footprint, and taking the extra steps to create and optimize social profiles is an excellent tactic for increasing visibility in search. For 15 years, Gayle Rogers has focused on building traditional and non-traditional advertising campaigns for the automotive industry, working with brands like Ford and Toyota. Now Gayle is Director of Digital Marketing at Strong Automotive Merchandising. He is a student of consumer behavior, dedicated to developing innovative digital strategies, increasing search visibility, targeted retail traffic and engagement for automotive dealers. KUDOs on your fine work! Your article Customer Story: The Intersection of Social and Local SEO is very informative and well presented. SEO is so important today to a sites success and yet it’s so often over looked.. great story but only one of many I would imagine.